I first heard of Goa Bhavan Canteen from a fellow foodie who was ranting about this seafood place in Juhu, on Twitter. The seafood sucker that I am, I decided to explore this place. Didn’t know about the awesomeness about this place until I went there one lazy Saturday afternoon. Goa Bhavan is a small local joint in the posh Juhu locality. Once you enter this place, you’ll see seafood lovers from all walks of life. This 5-tabled joint serves authentic Goan cuisine- cuisine that will take you straight to the beaches of Goa. I went here on a Saturday afternoon for Lunch and the place was packed with people waiting for their seats. As the usual tradition goes, we started by gushing our palates with freshly made Sol Kadhi. Refreshing, flavorful yet subtle, the Sol Kadhi was indeed a good start to our gastronomic journey. 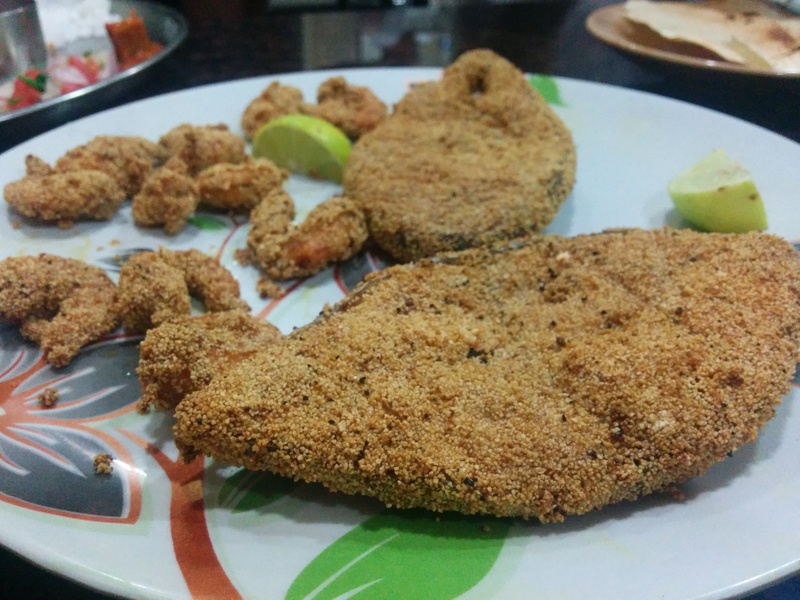 We started with our very own customized seafood platter which included some crispy Surmai (King Fish) Rava Fry, Prawns Rava Fry and my favorite Bombay Ducks. What I really liked about the Rava Fries was that they were crisp, almost oil free and spicy (the thick rava coating and over frying usually makes the fish go bland & tasteless). According to me, the best way to experience seafood is to hog on a variety of fish. I know it’s not reasonable at most seafood joints due to cost constraints, but trust me, the rate card here will surprise you and make you want more! After the crispy rava fries, I wanted some more and thought I will get some more Prawns or Surmai fries with the Fish Thali. But unfortunately Goa Bhavan currently only serves Mandeli (Golden Anchovies) fries with their Thali. 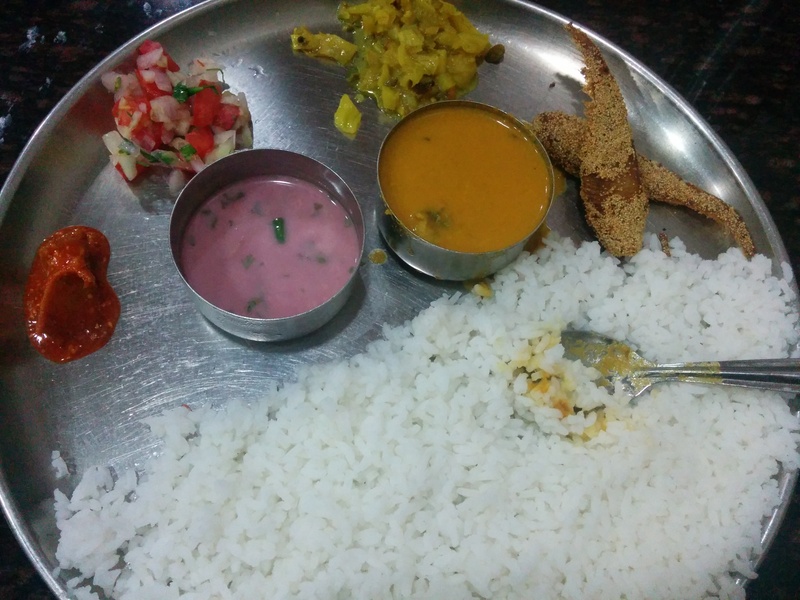 The thali consisted of a fish curry, steamed rice, sol kadhi, one goan-style veg side dish (keeps changing everyday), koshimbir (mix veg salad), pickle and 2 pieces of Mandeli Rava Fry. Everything in the Thali is served unlimited, except for the fish fry & rice. The only thing that disappointed me was that there was no menu. The staff could be more informative, especially in the absence of a menu. Everyone needs to know what I’m ordering and how much it is for. If this is sorted, I’m sure this place will be a li’l more loved. All in all, a clean canteen like place, serving some reasonable priced and lip-smacking seafood. As I always say, Mumbaikars have to really explore the gems like these to fall in love with the city, all over again! I urge you to go here this weekend and make it a Happy Weekend. ← How About Celebrating This New Year, With The Foodie In You? Have been meaning to visit for the longest time. Thanks for the review. Now even more keen on it.